The fatality rate in motorcycle crashes is 12 times greater than the fatality rate in crashes involving only passenger cars, the Georgia Department of Transportation reports. Tragically, 76 percent of motorcycle riders involved in crashes are either injured or killed, compared with just 16 percent of those in passenger cars. Motorcycle accidents are especially serious or even deadly for riders because motorcyclists have little protection when struck by a vehicle. Motorcyclists and their passengers are also likely to be thrown from the bike in a crash, which can result in serious head injuries, paralysis, amputations or death. If you or a loved one has been hurt as a result of a motorcycle accident, you may have the legal right to make a claim for damages. 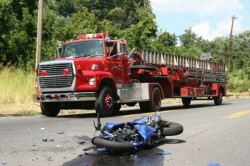 An experienced Atlanta motorcycle accident lawyer at Parsons & Associates, P.C., can help. Motorcycle drivers and passengers are far more likely than those in passenger cars to die in an accident. In fact, motorcycle accidents are so much more likely to result in the death of the motorcycle rider that the Insurance Institute for Highway Safety (IIHS) indicated that the death rate per miles traveled for motorcycle riders was 37 times greater than the death rate of car occupants. According to the Georgia DOT, around one-third of all fatal motorcycle crashes occur in rural counties rather than on urban roads. The IIHS reported that 55 percent of motorcycle crashes occur on non-freeway major roads, 31 percent on minor roads and 13 percent on interstates/freeways. Regardless of where they happen, the sad fact is that many motorcycle accidents occur because of preventable causes, especially careless decisions made by other drivers. Many crashes result from the failure of other drivers to notice motorcycles and give them the respect they deserve. Determining who was to blame for an accident is very important because the person responsible for causing the crash could be held legally liable for any damages that result. This is true whether the person responsible was the driver of the other vehicle, or the government agency responsible for maintaining the roads, or the manufacturer of a defective product. Motorcycle riders have no metal cage, seat belts or air bags to protect them in an accident. Wearing a helmet can provide significant protection from head injuries, with the Centers for Disease Control and Prevention (CDC) reporting that 37 percent of motorcycle accident deaths could be prevented through helmet use. However, even a helmet cannot guarantee that a motorcyclist won’t be killed or seriously injured. When a motorcyclist is hurt in a crash, the victim often requires expensive medical treatment. He or she may be forced to take time off from work or may be unable to work at all after the accident. The victim may be in pain and unable to do the things he or she enjoyed before the crash. In the most tragic cases, the victim does not live through the accident. The person responsible for the crash should pay compensation for all of these losses. This includes both economic losses (medical bills and lost wages, for example) and non-economic losses for things such as pain and suffering, emotional distress and wrongful death. If you or a loved one has been involved in a motorcycle accident, you could be entitled to compensation if someone else’s negligence or carelessness led to the crash. Police reports, witnesses to the accident, statements of those involved in the crash and the testimony of an accident reconstruction expert could all be helpful in making a claim for damages. Determining whether you can make a claim and who should be held responsible can be a complicated process. You should have a knowledgeable and experienced legal advocate on your side to represent your interests. An Atlanta motorcycle accident lawyer at Parsons & Associates, P.C., can help you protect your rights after a motorcycle accident in Georgia. There is no cost to have a lawyer at Parsons & Associates, P.C., review your case and explain your rights. You must file a claim within a certain amount of time to protect your rights. It’s important to act promptly. To learn more about how we can help you, call us today at 770-422-9000, or fill out our online contact form to schedule a free consultation.